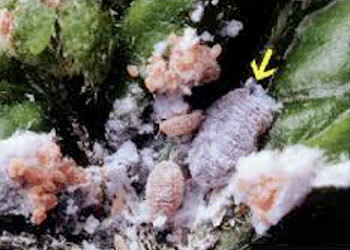 Adult mealybugs are small (about 3 mm long) and pink in body color but covered with a waxy secretion. The waxy filaments are short and females are usually obscured by this white mealy wax. Pink hibiscus mealybug feeds on the soft tissues of many plant species and injects a toxic saliva that causes curling and contortion of leaves. The entire plant may be stunted and the shoot tips develop a bushy appearance. The mealybug excretes honeydew which encourages the development of black sooty mold. Very high mealybug populations can kill plants.